Not content with saying hello in just one language, playful Korean label Conichiwa Bonjour also takes a global magpie approach to its style inspirations. It’s the turn of American campus style, Japanese katakana lettering, and Korean bootlegged streetwear in three killer sweatshirts from the brand that have just dropped at London menswear destination Garbstore. Sayonara and bon nuit. A leather jacket is one of the greatest investments a man can make. So to get one with a mighty discount, and from pretty much the best place you can snag one on the high street, AllSaints, is a coup. 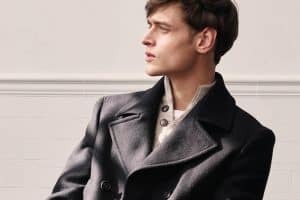 We’d get ourselves this masculine number, with 40 per cent off and pat ourselves on the back for the slick wheeler-dealer we were born to be. The rest of the brand’s sale is also well worth your attention. Slick Danish outerwear brand Rains is one of our go-to choices for rainy spring weather. Its latest collection comes as a new partnership with off-kilter design e-tailer Made, inspired by the northern lights. As such expect mystical mints and midnight blues on its staple pieces like the anorak and this slimline backpack, which is completely waterproof so you don’t have to worry about any revision notes getting soggy in a caught-off-guard April shower. It’s a London affair on the latest drop from menswear brand Folk with the label linking up with fellow L-town dweller, painter Alfie Kungu for a vibrant and abstract series of camp collar shirts, shorts, bucket hats and tees splashed with Kungu’s impressionistic graphics. We’d bathe in the luxurious fragrances from Italian perfume house Acqua Di Parma if we could – budget permitting – and with its relaunched Barbiere collection you can squeeze a few more of those grand scents into your grooming routine. From clay masks and beard washes to shaving creams and your classic after-shave pretty much everything is covered and all infused with ADP’s failsafe concoctions of blended oils and fine smells. From the Adidas three stripes to Nike’s swoosh, every top sneaker brand has to have a calling card. It’s the double-decker vulcanized rubber soles that distinguish Slovakian sneaker brand Novesta from the pack, drawing admirers the world over. Including, it seems, Manchester tastemaker Oi Polloi which has have worked with the brand to create this cult tennis shoe just as it was made when introduced in 1939. Denim every day might have got you through the bitter winter months, but that heavy duty cotton will put your legs at risk of heat stroke should the weather reach the giddy heights we had last summer. 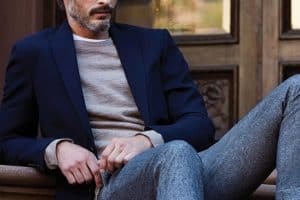 Much better to invest in a pair of these lightweight and stretchy chinos from the high-end offshoot of H&M, Arket, that are just as versatile as the trusty black jeans you’ve been living in since last October. Ice cool skatewear brand Polar might not have the mainstream adulation of Supreme and Palace, but for those in the know its blending of premium fabrics with minimalist streetwear stylings marks it out as one of the best in the genre. This cap cast in the brand’s favoured royal blue is classy but with the idiosyncratic touch of a YKK track adjuster at the back. Sun’s out, tortoiseshell shades out. The classic frame is timeless for a reason – namely, that it blends well with most skin tones, while black frames can wash out paler types. These rounded options from Mango Man are perfect with an added bit of copper to further fancy things up for the summer ahead. Ever since James Dean wore the hell out of a red Harrington in Rebel Without A Cause we’ve craved a simple red jacket to fulfil our menswear dreams. Then out comes achingly hip Parisien label Ami with this rouge beauty in rain-evading nylon that will go effortlessly with a white tee just as Dean wore his. Dreams really do come true. Menswear e-tailer Mr. Porter has smashed it out the park again with its latest seasonal drop of garment goodies from in-house label Mr. P. This interesting take on the classic and on-trend rugby shirt caught our eye from the drop with that naughty pink stripe cutting through the traditional navy and ecru and an extended ribbed hem helping to sidestep expectations. The history of American sportswear brand Perry Ellis is long and illustrious, its 90s heyday gifting the world of fashion with designer Marc Jacobs just before he made sartorial history at Louis Vuitton. Its recent capsule collection recreates some of these iconic looks, and with 90s style trending hard it’s a great time to reminisce with pieces like these colourful side-stripe joggers. Having made its name as a tennis shoe brand beloved by the great Bjorn Borg, Tretorn has since reinvented itself as one of the leading lights in sustainable fashion. The Scandi brand has combined these twin reputations together on the reinvention of its flagship shoe, the Nylite, with a new 50 per cent recycled rubber sole, while the heavy cotton canvas up top has been locally sourced to reduce the environmental impact of its production. Cycling to work hasn’t been this popular since before everyone had their own cars, and to accommodate all the hot wheelers on their sweaty commutes, high street chain Zara has put together a new collection of breathable yet office-appropriate clothing like this trim jacket made out of a special stretchy fabric to aid movement and keep you comfortable at the same time. Rose gold is one of the big watch trends at the moment, and the attractive hue is brought out splendidly on this chunky watch by American preppy style purveyor Tommy Hilfiger. Bonus points for the handsome brown leather strap and three sub-dials to help you remember what day of the week it is. We’ve been in love with Parisian label Maison Kitsuné ever since that starlit night we spent under the stars by the Eiffel Tower. You whispered you loved us but we never saw you again and now all we’re left with is this zesty navy T-shirt from your SS19 collection. Actually, we’re pretty happy with that deal truth be told. Often the best collaborations are those that come from the unlikeliest of places. Take this one between Oxford Pennants, a New-York based company that makes vintage-inspired felt pennants and flags and classy American label J. Crew. The former’s prowess is put to good use on this graphic of a mid-century inspired swallow, a symbol historically meant to offer safe travels to sailors. From high street stores like Uniqlo to streetwear kings Noah, the graphics of graffiti artist Keith Haring have been regularly used by fashion brands to zhuzh up their classics. Nothing gets more classic in menswear than the Lacoste polo shirt which the French sportswear brand have sprayed Haring’s graphics all over, although our favourite piece from the release is this tricolor sweatshirt that’s so bold it’ll take all the legwork out of planning the rest of your outfit. There’s not much of a middle ground between watches under £500 and those sparkly Swiss-made timepieces that cost an arm and both legs. 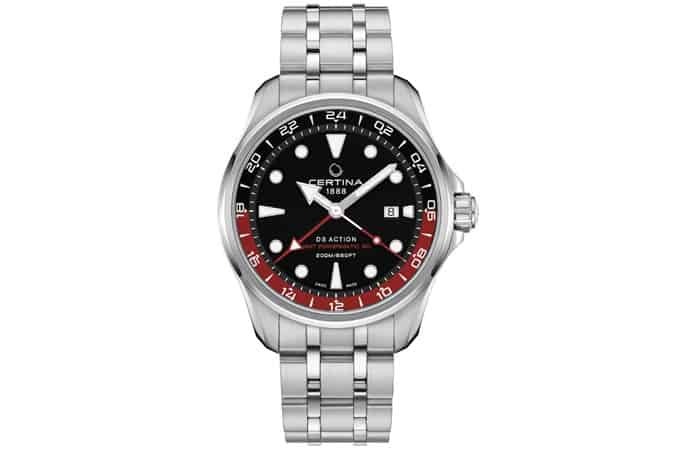 Swiss watchmaker Certina luckily operates in this relative no-mans land and its new range of DS Action GMT Automatic watches belie the relatively affordable price. In this sporty number you get an automatic watch with an impressive power reserve of 80 hours and the ability to work under 200 metres of water, should you need to. Ready to tropic like it’s hot this coming summer? You’ll need a Hawaaiin shirt to look cool in the heat, the zanier and eye-catching the better. This one from high street shop Burton has a gaggle of goldfish hiding amongst the flora, which is pretty novel if you ask us. Slot under a slim black suit for funky fresh summer tailoring or with white chino shorts when on your hols. Italian brand Benetton named fashion designer Jean-Charles de Castelbajac as its new artistic director at the tail end of last year and we’re just starting to see the fruits of his technicolour vision, with a new capsule collection of throwback designs that come unisex and made out of organic cotton. So far, so colourful.